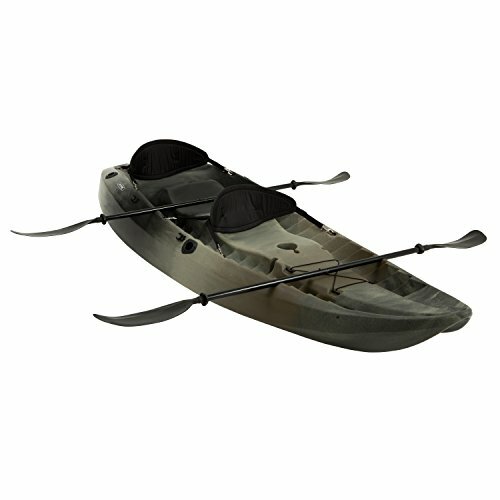 The tandem kayak by Lifetime is marketed as the ultimate kayak fishing model. This kayak features a hull that’s designed for great tracking and ultra-durability, as well as highly adjustable parts, a six-foot storage hatch, and three fishing pole holders. As a model that’s packed with all the bells and whistles, is it truly one of the best models in its price range? Let’s find out. This is a ten-foot model with plenty of storage space, which allows you to load up on supplies for a fun day out on the river. This model weighs in at 65 pounds and is very wide, allowing it to easily accommodate three average-sized adults or a maximum of 500 pounds of weight. The waterproof rear entry point, built-in tie downs, and fold-down paddle clips offer a ton of convenience for the fishermen, and value for the money. To add more, upon purchase, you’ll get a limited, five-year warranty. On the rear of the frame, you’ll also find a molded hole designed for an optional trolling motor, which can really come in handy if you’re heading far out or want to take your kayak out on the ocean. A big minus for some users is the lack of cushioned seating. While still pretty comfortable to use, which is thanks to the padded backrests, the seats themselves are just made of hard plastic, which can make fishing for a long time a little uncomfortable. This product has a cockpit that raises the user out of the top, allowing the feet to rest comfortably in the designated footrests. This means riders will have the necessary support regardless of height. Being raised in this position will also prevent the riders from sitting in water, with only the legs getting wet; thanks to the drainage holes found in every foot well. There are a number of features that set this model apart from its competitors. The vessel is able to track easily, thanks to the hull’s intelligent design, and it offers an excellent base to stand on when the user is sight fishing. You’ll also find a ton of space that can accommodate a number of riders and enough support to allow riders to side straddle when fishing, and all without the worry of tipping the kayak over. While it may seem minor, the color scheme of the boat which is an olive green can be a safety issue of sorts because it blends in with the vegetation and water, which can make the kayak hard to spot by other fishermen. That becomes a problem because although this is a sturdy kayak, it’s definitely not built to withstand a collision. With a few fishing pole holders and a dedicated watertight storage compartment and shock ropes to keep your gear secure, this model seems to come with everything the fisherman needs out on the rough seas. The fact that this kayak comes with the right gear you need to get started is also a huge selling point. Two backrests and two paddles come included, so you’ll be able to take this beast out on the water right after delivery. With its carry handles and relatively low weight, transporting it is easy. Users can also add an optional trolling motor for those times when you need to reach a far out fishing hot spot fast. The Lifetime 10-foot, two-person kayak boasts an array of features to make your fishing trip easier and more comfortable. Firstly, this kayak is actually able to seat three people, so when you’ve got that extra friend who wants to tag along, you’ll be able to make room for them, especially since it has a 500-pound capacity. Although you may lose a decent amount of space, you still have a compartment where you can store your fishing accessories. The kayak itself is constructed with high-density polyethylene, producing a craft so strong and durable that Lifetime back it with a five-year limited warranty. This also provides UV protection that helps to resist any fading, peeling, or cracking. Completing the total package offered with the Lifetime are two double-sided paddles, paddle clips, two padded backrests, and three fishing pole holders. This lets kayakers get out onto the water sooner than most other kayaks currently available. For those looking for a tandem kayak but are a bit more budget conscious, then the Sevylor Coleman Colorado might be a good choice. The Sevylor is also extremely well constructed using high-quality materials such as 18-gauge PVC and 1000D tarpaulin to help prevent any punctures. It even comes with motor fittings to add more versatility to your fishing capabilities. Users get some great features such as numerous adjustable Berkley rod holders, a guaranteed airtight system, and adjustable seats. However, in contrast with the Lifetime kayak, this does not come with multiple accessories and enough storage space. On the other hand, if you have a slightly higher budget and want to get a little more out of your kayak, then you might want to consider the Driftsun Teton 120. Being 12 feet in length, the Teton is extremely stable and easy to control, making it great for those rough water fishing trips. It has a similar weight capacity as the Lifetime model but has a small passenger seat in the center that allows for easier solo paddling. You’ll also benefit from four flush-mounted rod holders and two mounting points for scotty accessories. Overall, this model by Lifetime is very close to being the ultimate fishing kayak; however, it falls just a little short due to some poor compromises in the design. While the manufacturer achieved their goal of creating a lightweight kayak that’s easy to transport, they failed to consider how well it would perform when the weather is less than ideal. Having said that, considering the affordable price and the ton of accessories that can be attached easily, this model is still a great choice. If you’re fine with moving at a more restricted pace and don’t mind dealing with paddling against hard winds and rough waters, then this is definitely the model for you. It’s a great choice for families or fishing buddies and features a ton of stability for a kayak that’s really built to last.